This deluxe 176-page hardback rulebook contains everything you need to play Core Space in one place. It is a companion product to the Starter Set and other associated products, expanding the game with advanced rules, background and customisation. 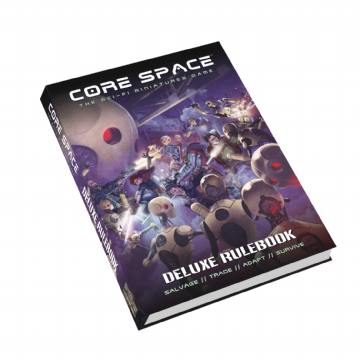 Core Space is a science fiction miniatures board game. Each player takes control of a band of Traders trying to make a living in a dangerous galaxy, all the while hunted by the Purge, a semi-sentient race of humanoid machines whose sole task is to harvest worlds.